We bought this for our 6 month old grandchild and love it. It has a wide range of adjustments and is easy to use. Bought this high chair for my 7 month grandson. He loves sitting comfortably at the table with his parents. Wipe clean materials easy care! I bought this highchair for my 8 month old baby. It has the height adjustment and space spacing. Some other great features includes easy to clean, removable tray. Rittenhouse cover is NOT spot washable!! I bought this because I loved the pattern. The chair itself is fine but there is a kind of film covering the black chair cover to make it waterproof or water resistant I guess. After just spot cleaning and wiping down, the film has bubbled up and separated from the fabric and it looks TERRIBLE! It looks so bad that I'm embarrassed to use it with any company over. I don't even feel comfortable donating it because it looks so bad! It needs a whole new seat cover and I just don't have the money to replace it right now. When I do, I'll buy another brand to replace this product as I believe a high chair cover should be WASHABLE and shouldn't be ruined by repeated wiping down and spot cleaning. I bought this high chair a few months back for when my granddaughter visited at first I was very happy but putting her in one time the top tray went flying and the spring shot out from underneath the top tray and is now broken, Now the one side is broken so I'm very disappointed with a high chair that is only used 1 a week when she comes to visit. Snack tray ruins this high chair! Have had this highchair for over a year and we love it! Easy to clean with the removable tray and fabric wipes clean easily. The adjustable height is convenient also. Proud grandma of tiwns. 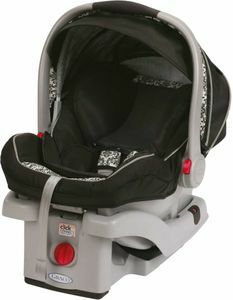 Bought this one and the grace swivel 3-1 seat. Like both so far. I recieved this highchair as a gift. One of the biggest dislikes I have is that it has the small snack trat bar with the leg divider. With this feature, i feel like I will not be able to use this highchair long. There is not enough room to fit my child and it is hard to get him out of the chair when he is done. I just started using this chair 4 weeks ago when my son started solid foods. I love everything about this product! It stores easily and I love that the seat reclines so my son, who can almost sit up by himself, can sit in it and eat his bottle while we eat our meal! I love that everyone is able to be at the table at dinner time. Family dinner time I see important and having everyone at the table is great. The tray is one less thing to clean up when you slide chair up to the table. I do love having the option to use a tray though. Good Quality with one minor issue. Assembly was quick and easy. Seems like a pretty good product with good value for the price. The only issue that I have is that it is difficult to unlock and unfold. It seems like the only way to unlock it is to force it open, which makes a loud snapping noise. I'm worried the locking mechanism will fail over time from being forced open. I love this chair.I can adjust its hight wherever want to.I use on my kitchen counter, at dinning table and easy to adjust the height.I fold it when it is not in use so no need extra space and fabric in center is machine washable which is great. I bought this highchair so my granddaughter would have a comfortable way to eat her meals while visiting without my daughter having to pack her own! It assembled easy, cleans easy and is easy to adjust. The best part is my granddaughter loves it! Thank You for such a great product. 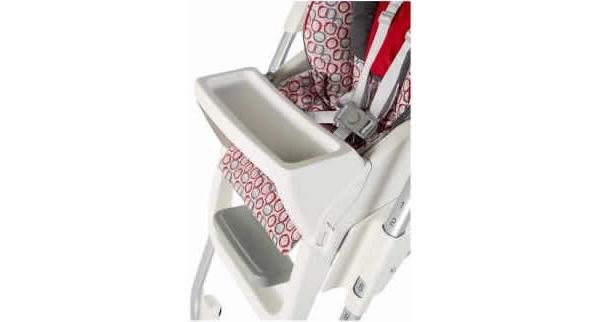 I purchased this seat for my grandchild--the seat padding is difficult to keep clean for messy eaters--food seems to get trapped in the many different creases of the padding. Having a difficult time with the tray not adjusting to our growing child and the plastic piece that is between the legs makes for a tight fit as the child grown. this piece is removable but not old enough to remove this safety feature. I'm Grammy and bought this Highchair for my house. I love that it is super light weight and that I can adjust the height. That way I can lower the chair to my eyelevel when I'm working on the computer. I get work done and she can sit next to me and we can babble with each other at eye level. product will do exactly what i need. I love that I can adjust the hight of this chair and it fits under the table (we have a high table). Fabric is of good quality, easy to clean. I am happy with my purchase. WE HAVE USED FOR 7 MONTH'S NOW, AND LOVE THE FEATURE'S - BUY THIS YOU'LL BE GLAD YOU DID. 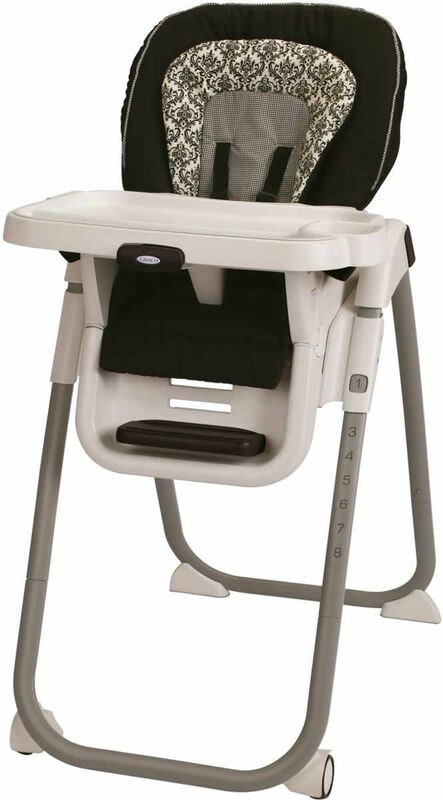 This high chair is easy to use and easy to clean. Actually purchased it from a neighbor and it was filthy, threw it in the washing machine (probably not supposed to) and it came out nice and clean and like new. The only complaint is that the little tray does not swing open to put baby in, either have to put her in with it on or remove it completely but no biggie. I do like that the big tray is easy to remove and put on and that it has another tray over it so it's very easy to clean. I've recently purchased the Tablefit Highchair after several days of research. I decided to go with this one because of the features and the reasonable price. It was pretty easy to assemble. I only needed to affix two screws that were provided. Everything else pretty much snapped into place. I was so excited to put it together and let my baby try it out. Once completely assembled, I sat my baby in it. She initially cried b/c she probably wanted to be "free", however a few seconds later she began to smile as she seemed comfortable in the plush seat. No more tears! I like that the Tablefit has 8 different height adjustments and 3 different recline options. It seems quite durable, but also has a bit of bulk to it. I thought that it would fold completely for storage and possible travel, however only the legs "fold", which makes the chair slimmer for storage or to leave against the wall in the kitchen. This is still a good feature for space-saving when not in use. The material is easy to clean...just wipe down. I like that the tray also has a removable insert that is dishwasher safe. I plan to keep this highchair because my baby really seems to enjoy it and it makes feeding time much easier! Even my husband thought that it was a good purchase when he saw it. I can see my daughter using this for quite a while. Thanks. We purchased this chair about a week ago for our grandson. This chair is very simple to put together and put away. All the features for securing the baby while using the chair are awesome. I definitely recommend this chair. This seat fits my son comfortably. The seat adjust allows him the right amount of back support as he grows. The chair comes with a removable plate for the tray to allow for easy clean ups. The design is very tasteful. This is slightly bulkier then some other chairs but it makes up for that with comfort for baby. My son is almost 10 months old and he fits in it perfect. 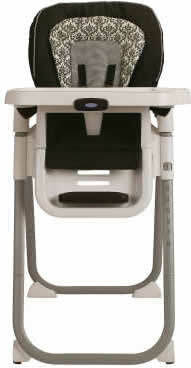 The high chair is one of the best products that I have bought from Graco yet. 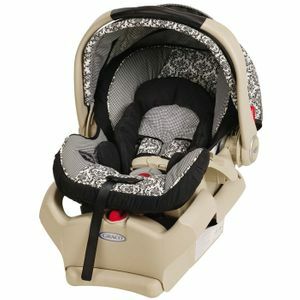 I also have the matching car seat and stroller which were also great. 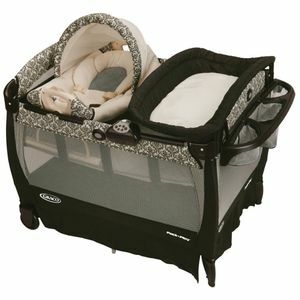 When I shop for my son I usually always shop Graco. Love the three different reclines options and height adjustments. I was little worried my 4 month old would be young for it but I wish I would have gotten it a month ago. Perfect for having him at my height while i cook dinner. 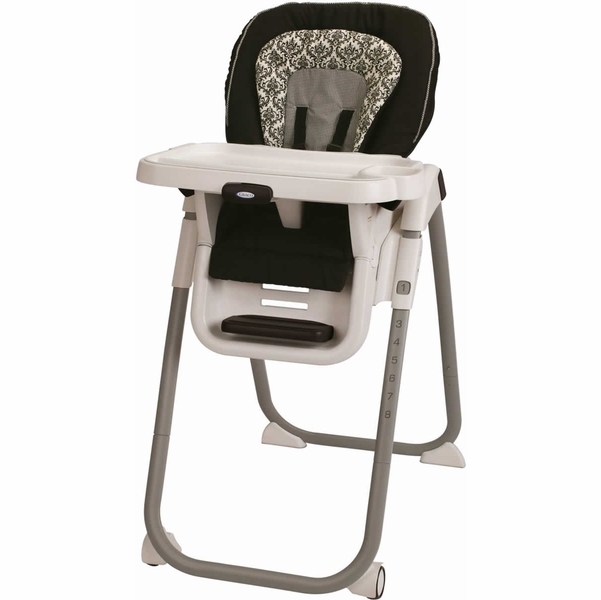 The high chair is easy to move around the house because of the wheels - portable is good. It also looks comfortable when baby sits in it. Also like the different slanted positions. Highly recommended! This high chair came together easily. One hand operation to remove tray. Quick to move around on front castors. I did not like the plastic feel of the cushion. I'm so happy we went with this high hair. First off it was very easy to put together. I love that it has a stationary snack tray and then the bigger one goes on top. I know having the removable top will be handy later. It's nice that it reclines. My almost 2month old was put in it for the first time and he loved it. Was happy that he could see what we were doing and giggled a bit. It looks like it will be really easy to clean too. My sister brought it for my niece who is now 7 years old, she passed it on to me my oldest daughter is now 5 years that chair is so great my one year is now using it. Totally worth the money. Highchair is strong and sturdy. I love how you can adjust the height. Baby loves his chair! I find the reclining back very usefull! Best feature ever. I've had some bad experience with another chair, and appreciated ours so much! Super easy to assemble, cleaning is also easy, it fits everywhere, and you can fold it, when you dont need it. Its great!! It fits in the trunk of my car. I am happy with it and will recommend it 100%! Baby loves his chair! I find the reclining back very usefull! Best feature ever. I've had some bad experience with another chair, and appreciated ours so much! Super easy to assemble, cleaning is also easy, it fits everywhere, and you can fold it, when you don't need it. Its great!! It fits in the trunk of my car. I am happy with it and will recommend it 100%! I love that this can be used up to the table with the rest of the family. This is definitely going on my registration list! I love all the features. It is easy to use and clean. I couldn't be happier with it! Easy to assemble. Easy to store. Bought it to use in 5th wheel trailer. Comes apart easily so we can store it when traveling. It does have a large base however I think this is good so chair cannot go over. Easy to clean and child fits well in it (22 lb 2 year old). This is a great high chair, my son loves getting in there n eat like a big boy. It's easy to clean and doesn't take much room at the table. I purchased this highchair for my son who is now 2.5 years old and I still love the ease of it. He can sit in the chair alone or he can he pushed up to the table to join the crowd. The only downfall I feel this chair has is the snack tray that snaps in on top of the main tray. The divider edge limits the pieces that can fit there such as a toddler plate. It does not allow the plate to sit flat so you have to remove the tray which leads to having to wash the entire tray not just insert. The machine washable feature is nice too for the cover and it stays in one piece wash after wash.
We bought this more than a year ago for our child care and they have been very durable for the high volume of use. I have one question, where can I find the seatpad replacement? I picked it out for my baby registry 5 years ago. It is now serving my second child and still works and looks great. I'm sure I will be handing it down once we're done with it. It is durable and versatile. Love it. i bought it last 2 weeks before my baby started eating solid and its great cause it fit really good in our table so my baby can have meal with us. 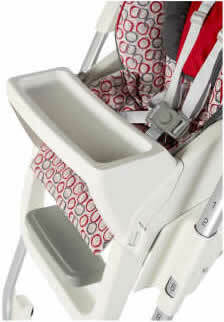 Great highchair, easy to clean! 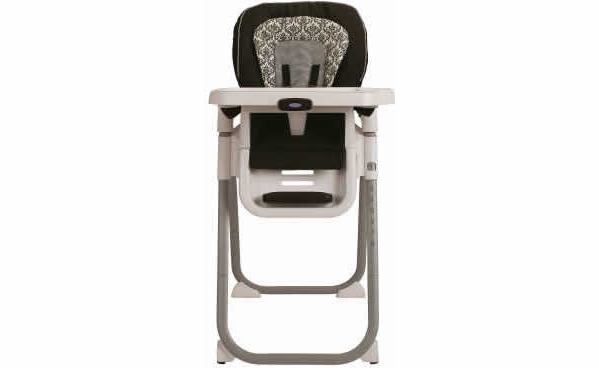 We purchased this highchair on clearance and have been so impressed! 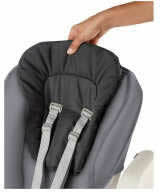 The foot rest moves as your child grows, all the padding is removable and can be washed as well as ALL the straps! Not a lot of tiny crevices that make cleaning a nightmare. We would purchase this again and definitely recommend to anyone!